$850.00 Membership Badge of the Detkomissiya (Children Agency) at the Central Executive Committee of the USSR, early to mid 1920s. $440.00 Trade Union of Transportation Workers, membership badge, Type 2, circa mid 1920s. Excellent condition. $380.00 Trade Union of Employees of Communication Industry, membership badge, late 1930s. Very fine to excellent condition. $950.00 Trade Union of Publishing Industry Workers, membership badge, Type 1	in hallmarked silver and enamels. This 1920s piece combines striking "revolutionary" design and superb quality. $140.00 Jetton to a Best Shock Worker, awarded to a timber factory worker in May 1933. 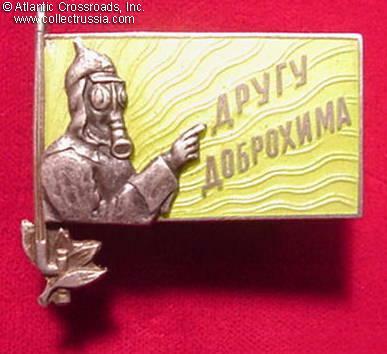 A typically early design with oversized pendant suspended on chains from a small screw back device featuring early Soviet state emblem. Engraved presentation on the reverse. $430.00 Stalin Campaign for the Bolshevik Sowing and High Harvest, award badge, early to mid 1930s. Very fine condition. $540.00 Badge "To a Best Shock-Worker" in Commemoration of the 15th Anniversary of the Revolution, 1932. A very impressive award in very fine condition. $1,195.00 Badge to a Shock Worker of the XVII Congress of VKP(b), Stalinskiy District, 1934. Magnetic steel, silver plating, enamels. $340.00 Society of the Cultural Linking of Town and Village, membership badge, mid to late 1920s. In fair to good condition. $260.00 Participant's badge of the All-Union VTsSPS Olympiad (Contest) of Amateur Performance Arts, Moscow, 1932. $475.00 Badge for 20th Anniversary of the Soviet Cinematography, #317, circa 1940. Very nicely made piece in silver and enamels, mint marked. In outstanding condition. $95.00 Moscow Intourist Guide Badge in bronze and enamel, dated 1934. In excellent condition. $330.00 First Spartakiada (Sports Competition)of VTsPS , participant's badge, 1932. In excellent condition and includes original screw plate.